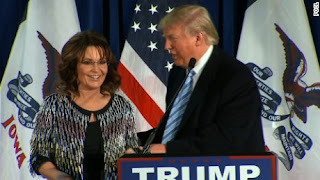 Palin’s first big speech on the national stage—the one she gave when she accepted the Republican nomination for vice-president—was carefully modulated, populist without being screechy, and sharply critical of Obama without being harsh or angry. Her speech yesterday endorsing Trump was pretty much the opposite: rambling, pandering, chock full of empty catchphrases, combative, and screechy—I mean literally screechy, as in the grating quality of her voice, which was apparently her way of showing enthusiasm. When CNN played it last night, I was looking at Trump's facial expression while he listened to her ramble on almost incoherently. I imagined him thinking to himself, "I hope that isn't what I sound like," a hope that would, alas, be in vain, since that is just what he sounds like to some of the rest of us. Well, maybe not quite that bad. But they both possess the same limited vocabulary. They both use the same awkward rhetorical phrasings that betray them as intellectually unserious people, neither of whom, I am willing to bet, have cracked a book in years, not even Trump's favorite one. In fact, ten bucks says that both of them have written more books than they have read, which is to say, not very many. You don't necessarily want an intellectual as president. We tried the "best and the brightest" thing, and it didn't work out too well. In fact, it was a man who the media derided as a know-nothing that is considered now even by many liberals as a great president: Ronald Reagan. But Reagan, unlike Trump and Palin, was a voracious reader. He knew what he believed and why he believed it. Yes, he loved to read Louis L'Amour novels. I take in an occasional western myself (Elmer Kelton rules!). But Reagan had read many of the great economic and conservative classics--no, not Going Rogue or The Art of the Deal, or the latest Glenn Beck book), but Russell Kirk, F. A. Hayek, Wilhelm Roepke, Frank Meyer, Whitaker Chambers, Ludwig von Mises, Malcolm Muggeridge, Frédéric Bastiat, and Henry Hazlitt. And he was well-versed in conservatism in general from being a frequent and long-time reader of William F. Buckley, Jr.'s National Review magazine. This is the main reason the frequent comparisons of Trump to Reagan are so manifestly absurd. The next time you hear someone make this comparison, remind them that Reagan was actually literate.